For more than 40 years, the Association of Fundraising Professionals (AFP) has been the standard-bearer for professionalism in fundraising. AFP represents 25,000 members in 163 chapters in the United States, Canada and Mexico, all working to advance philanthropy through advocacy, research, education and certification programs. Among our main purposes is the promotion of the AFP Code of Ethical Principles and Standards of Professional Practice and the Donor Bill of Rights. 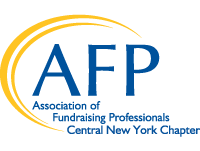 If you are a fundraising professional (full or part-time) in the Central New York region who upholds the AFP Code of Ethics, you are be eligible for membership in the Association of Fundraising Professionals—Central New York Chapter! Our active Central New York Chapter has over 100 members and offers great benefits, exclusive to our members. Why not submit your application today?